Hotel Charlot, Berlin discount hotels and accommodation. 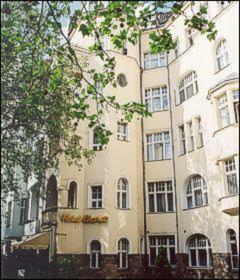 Our hotel is located in the heart of the western city of Berlin. In only a few walking minutes you will reach the Kurfurstendamm with its opportunities for shopping and dining. From here, there is a direct connection to the exhibition centre available. Relax in one of the comfortable rooms , direct dial telephone and TV. Our hotel offers 70 beds, an elevator and hotel-own parking lots for rent. A rich breakfast buffet is offered each morning. View photos, room descriptions and make online reservations at Hotel Charlot. Save on room prices at Hotel Charlot, Berlin.